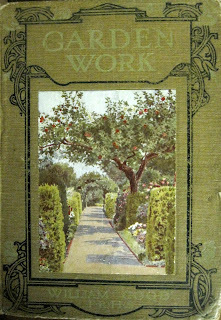 I recently purchased a copy of Garden Works by William Good F.R.H.S. (Blackie and Son Limited, 1913) after Dee of Red Dirt Ramblings taunted me with a picture of the cover. I had no idea what it was about, but that didn't stop me from finding a reasonably priced copy and ordering it up because it had an interesting cover. As soon as it arrived, I did what I usually do with old gardening books. I went through it looking for old newspaper clippings and little scraps of paper with hand-written notes. Sometimes I get lucky and I find a few such treasures, other times I must be content with what's on the printed pages. After I look for loose papers, I go through the table of contents. I find that many general gardening books usually start out with a chapter on soil, and this one did just that. "The soil is the all-important matter in gardening, therefore it is necessary to have some knowledge of the nature of soils, and the conditions necessary for the successful cultivation of plants, before proceeding with other subjects." Soil first, then the plants and other subjects. That's a good thing to remember. What I found unusual in this book was a chapter on "Funding the Garden". Curious, I turned to that chapter, Chapter XVII, and read the first paragraph. 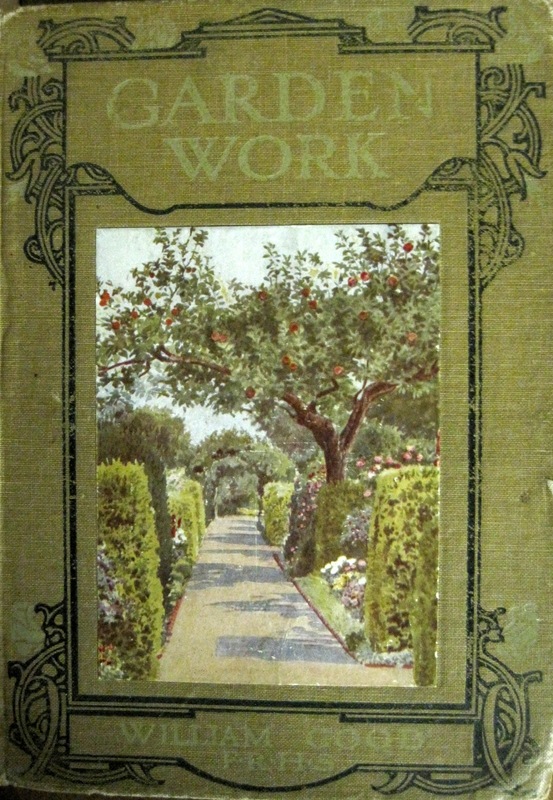 Few gardens are created exclusively from the soil, plants, rocks, and other features of the property, therefore it is necessary to determine how to fund the garden and what amount of money should be allotted to it, though a well-thought out and well-managed garden can be made with limited funds and equal or surpass that of a poorly planned and poorly manged garden made with an abundance of funds. Turning to the next page, my eyes nearly popped out and my heart began to beat twice as fast when I picked up the loose bit of paper that seemed to have been left there for as long as the book was around. It was a stock certificate, dated April 1, 1912. I recognized the company name and wondered if it had any value. I'll make this short. That stock certificate did have value, more than I ever thought it would. When I cash it in, I'll have "an abundance of funds" to use on my garden for quite some time, and left over funds to keep buying and rescuing old garden books. I don't know the exact amount, but I know it will be quite a lot. I am working with the company, a lawyer, and a broker to determine the stock's value which will be based on 100 years of dividend payments, stock splits, and interest. There's no doubt, by the way, that it is mine to cash in because it says "To the bearer of...". I feel like I've won my own private Mega Millions lottery. I feel like I'm set now. I feel like this spring is going to be a great spring, greater than any other. And I've had some great springs. There was the year I discovered a new plant species and the spring I found out that the boulder in my garden glows from outer space. I'll never forget the spring I found the underground caverns filled with Indian artifacts. And wasn't I a klutz when I knocked over that plant stand and found a time capsule of old family papers inside? Two springs ago I was growing a super-fast growing tomato. That sure was fun and with this early spring, I thought I might repeat that. Then last year, the old woman at the door made her first appearance, and I learned a valuable gardening secret. Forget all that. It's in the past. This year, the year of the stock certificate, is going to be the best gardening year yet, starting today, April 1, 2012. Oops, I meant "fun to read about." Darned keyboard. HA! But it did make me think about the $400 I found in the year book my son had made at school in Grade 1. Yes, it's true, and I was happy to find it. I had put it there and forgotten where I had put it. Lost for years until I flicked the pages and out it fell. I immediately left for the nursery. Enjoyed your story, Carol. Oh dear Dee, do you suppose we should unpack? Wow! You hit the jackpot and Oprah picked me to have a gardening show on her new network! Congrats to both of us. Haha, totally had me for a minute there...! You had me until the end... nice job! Whoa, I missed the other comments--I'm in for that trip to the UK, too! When do we leave? ?